you probably wouldn’t eat them. That was the premise that BU biopsychologist Alice Cronin-Golomb and her research partners adopted when they designed the “red plate study.” Their idea was to see whether senior citizens with advanced Alzheimer’s disease would eat more food from red plates than they did from white ones. The researchers in the Vision & Cognition Lab of the Center for Clinical Biopsychology, which Cronin-Golomb directs, had reason to hope that their experiment would succeed. Nursing home staff often complain that Alzheimer’s patients do not finish the food on their plates even when staff encourages them to do so. Forty percent of individuals with severe Alzheimer’s lose an unhealthy amount of weight. Previous explanations for this phenomenon included depression, inability to concentrate on more than one food at a time, and inability to eat unassisted. Cronin-Golomb and her colleagues took a different approach. They believed this behavior might be explained by the visual-cognitive deficiencies caused by Alzheimer’s. Patients with the disease cannot process visual data—like contrast and depth perception—as well as most other seniors. So Cronin-Golomb’s team, led by then-BU postdoctoral fellow and current Senior Lecturer in Psychology Tracy Dunne (GRS’92, ’99), tested advanced Alzheimer’s patients’ level of food intake with standard white plates and with bright-red ones. What they found was astonishing—patients eating from red plates consumed 25 percent more food than those eating from white plates. Since these findings were published in 2004, some nursing homes have made red plates the norm. A private company has even marketed special red plates for seniors with visual impairment. The CAS researchers’ approach to the problem of decreased functioning was what led to their breakthrough. Whereas many scientists look for drugs to treat degenerative cognitive diseases like Alzheimer’s and Parkinson’s, Cronin-Golomb and her team focus instead on finding visual aids that can improve patients’ quality of life. By assisting Alzheimer’s and Parkinson’s patients with their visual perception, the researchers actually are able to improve the subjects’ mental functioning. It is generally known that memory problems are associated with Alzheimer’s disease, but many people don’t realize that vision problems can plague these patients as much as their mental challenges do. Cronin-Golomb and her team put subjects through a battery of tests to determine their visual capabilities—visual psychophysics tests to look at contrast sensitivity, color discrimination, and depth perception; neuropsychological tests to examine object recognition, word reading, facial recognition, and pattern completion; and, finally, tests to determine whether the subjects perform better using visual aids, such as measuring cups with larger lettering. Once researchers understand each subject’s abilities, they can then assess how various visual aids improve a patient’s visual perception. One experiment the team conducted was to test which shades of gray pills were easiest for subjects to pick out. Seniors commonly take multiple daily medications, but pill manufacturers often don’t take into account patients’ vision problems when choosing pill colors. The researchers found that with the right shade of gray, they could help patients more easily locate their medications. Cronin-Golomb also studies other behaviors caused at least in part by visual impairment. In Parkinson’s patients, for instance, her research suggests that walking through a doorway or experiencing other visual triggers may precipitate a patient’s “freezing,” or being unable to move. The team’s research lends itself to immediate practical applications, and team members are eager to share their knowledge. They collaborate with colleagues at BU Sargent College, the Boston University Alzheimer’s Disease Center, and the Department of Neurology at the School of Medicine. They also educate local caregivers for the elderly about how to use visual aids to improve patients’ functioning. Many of these caregivers are family members taking care of loved ones. Others are professional caregivers at day programs for Alzheimer’s and Parkinson’s patients, as well as architects designing living spaces for older adults. Laudate is one of many students entering the field of neuroscience today who will help define its future direction. The study of neuroscience at CAS has grown dramatically over the past two decades. When Cronin-Golomb joined the BU faculty in 1989, after getting her PhD from the California Institute of Technology, there were few students in the field of what was then called biopsychology. 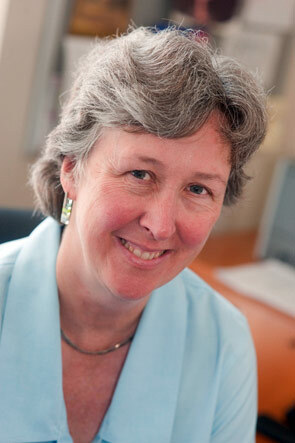 She played an instrumental role in cultivating the growing student interest in neuroscience. She developed the undergraduate neuropsychology course, which has become a barometer of the growing student interest in the field. Each year enrollment in the course grew until there were 60 students and a waiting list. The steady growth of interest in this and related courses led CAS to establish a neuroscience major in 2008. Mentoring the next generation of neuroscientists is a top priority for Cronin-Golomb and her fellow CAS professors connected with the neuroscience major. In the Vision & Cognition Lab, graduate and undergraduate students participate in the leading-edge research. Cronin-Golomb’s goal is not only to train others; she is also driven by a personal connection to, and respect for, the elderly. While some people stigmatize Alzheimer’s and Parkinson’s diseases and approach them with a sense of dread, she recognizes that the elderly, including some of her test subjects, are full of vitality. Avalanche expert Henry Schniewind shows off-trail adventurers in the Alps how to traverse the slopes without triggering trouble. In tall ships, whale watch boats, and children’s classrooms, Joanne Jarzobski teaches us to care for Cape Cod’s magnificent whales. David Branigan recycles bikes, rolling them out around the globe to power developing economies and empower local people to prosper.